Today I am welcoming fellow World Castle Author Jeff Horton. I’m thrilled to be a part of his summer blog tour. 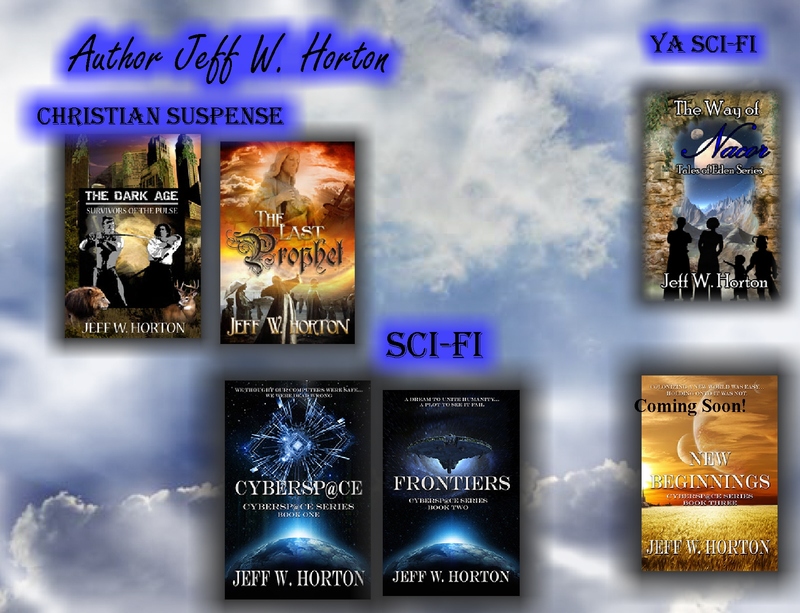 Jeff writes Christian Suspense, YA Sci-fi, and Sci-fi/Suspense. Today I wanted to feature , Frontiers, his second book in the CYBERSP@CE Series. If you live in fear that your world will be destroyed by an internet attack, this book might be the one for you. I’m sure afraid to enter my info into any system these days, I don’t know about you. I often imagine someone is hacking into my video camera and might be watching me with a bad hair/makeup day. That is a scary thought! Anyway, without further ado, here is Frontiers. Someone doesn’t want to see this happen and will stop at nothing to see it fail―including murder… When the Frontier is sabotaged, it leaves Hank stranded and alone to die in the Alpha Centauri system. With their dreams crumbling around them, will they be able to discover who is behind the plot to steal the alien technology, and to murder those closest to it? Where can you find Jeff?